Compact and portable, ideal for travel. What can I use the swivel screen for? Screen rotation is mostly used when mounting your player into a headrest holder, however if you have very little room while using your player while sitting down for example, on a couch, at an airport terminal or an a train, you may be able to get a better viewing angle by rotating the screen and sitting the player elsewhere other than on your lap. If you are unable to play some of your existing video files which you may have saved on your PC for example, there are many free file converters available on the internet which are reasonable easy and straight forward to use. The first file you convert may be a little tricky but after that it should become a relatively easy exercise… it is usually a 3 step exercise; 1) Select a file you want to convert, 2) Select the settings you want the final file to be converted to, and 3) Select where you want the finished file saved to. Please just remember that the preferred files for playback on this player are DIV X, AVi and MPEG4. This DVD Player has an AV input socket jack as well as an AV output socket jack. This means you can playback video from an external device or vice versa - playback video from your player to an external TV. The cable used for this is supplied with your player and is called a AV Jack to Composite AV cable. What is Advanced Skip Buffer Technology? This simple means that about 3 seconds of the video during playback if buffered (constantly saved and played back from the internal memory instead of from the disc) so if you manage to hit a large bump while driving, it won’t interrupt playback. 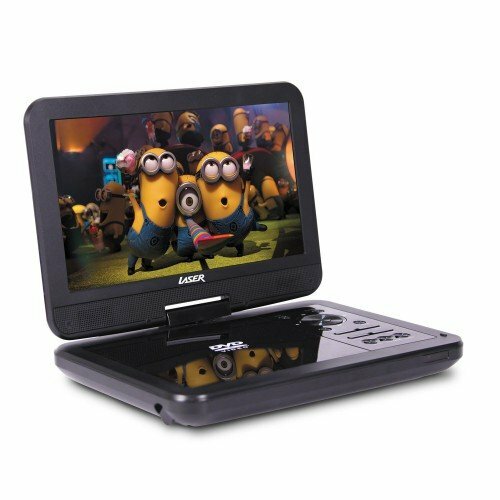 With a big 7" super bright colour LCD screen, this portable DVD / CD player can be taken anywhere - especially in the car, train or on a plane. The 180 degree swivel screen mkes this device not only fun to use but practical for viewing. Not only does it play content from discs, but also electronic files on USB storage as well. It comes with a full-function remote control as well as a home power adaptor (240v in the wall) and a car power adaptor (12v cigarette socket). Perfect for that long road trip or commute to keep the little and big kids entertained. Accessories included Bonus carry case / head rest holder, Australian /New Zealand SAA approved power adapter, AV cable ( to connect to TV), Car charger, Remote controller, Earphone.